Converse will launch two new Super Mario-themed sneakers for no less than ¥20,000 (roughly $200) in late August in Japan, with Bowser and Mario on them. 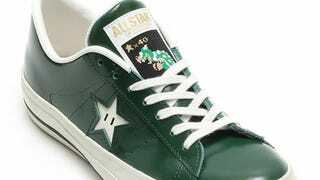 The stars in Super Mario games match Converse's 'All Star' brand after all. They're a follow-up to a black-and-white series, released back in 2012, this time the design is a bit different.